What is the equivalent of Ctrl + K + F and Ctrl + K + D on Windows in Visual Studio for formatting, or "beautifying" code in the Visual Studio Code editor? Alternatively, you can find the shortcut, as well as other shortcuts, through the search functionality provided in the editor with Ctrl +Shift+ P (or Command + Shift + P on Mac), and then searching for format document. You can also customize this shortcut using preference setting if needed. 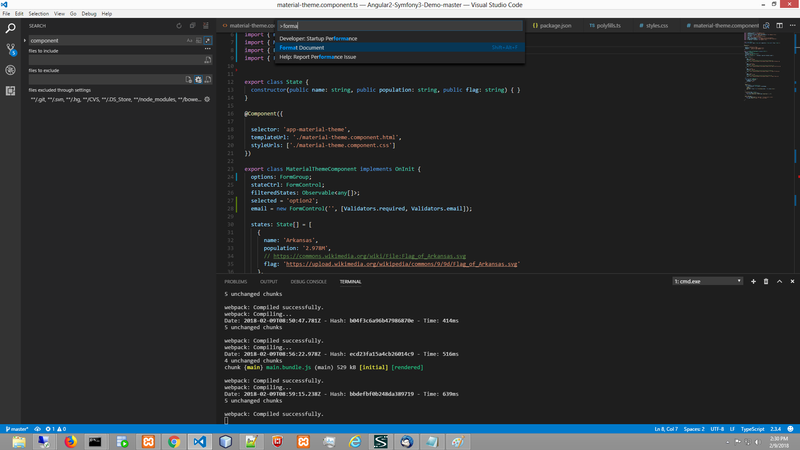 Visual Studio code allows user can customize the default settings. If you want to auto format your content while saving add this below code snippet in work space settings of visual studio code. // You can auto formate any files based on extensions type. You can add a keybinding in menu File → Preferences → Keyboard shortcuts. The right key combination is Shift + Alt + F.
Click File -> Preferences -> Keyboard shortcuts. Under Default Keyboard Shortcuts, search (Ctrl + F) for editor.action.format. You can add a keybinding in "Preferences->Keyboard shortcuts"
As per Visual Code version 1.28.2 this is what I found. editor.action.format no longer exists. It has now been replaced by editor.action.formatDocument and editor.action.formatSelection. Type editor.action.format in the search box to view existing shortcuts. A pen like icon appears to the left - click it. A pop-up appears. Press the desired key combination and press enter. On Linux it is Ctrl + Shift + I. For other languages, you might need to install a specific language package. VS Code 1.6.1 supports "Format On Save" which will automatically pick up relevant installed formatter extensions and format the whole document on each save. Select Format Document (Alt + shift + f) from menu box. On Ubuntu it's Ctrl + Shift + I. Just right-click on the text and select "format code". For some reason Alt + Shift + F did't work for me on Mac VSC 1.3.1, actually the command "Format Document" don't worked at all. But command Formatter worked very well. Shift + Alt + f does the job just fine in 1.17.2 and above. On Visual Studio Code, Shift+Alt+F is doing what Ctrl+K+D is doing on Visual Studio. The format shortcut in C# didn't work for me until I installed Mono for Mac OS X, DNVM and DNX. Before I installed Mono, the auto-format shortcut (Shift + Alt + F) worked only for the .json files. On Mac Shift+Alt+F works for me. Code -> Preferences -> Keyboard Shortcuts and filter by keyword 'format'. Add and save "editor.formatOnType": true to settings.json (which overrides default behavior for the project you work on by creating .vscode/settings.json file). Windows %APPDATA%\Code\User\settings.json Mac $HOME/Library/Application Support/Code/User/settings.json Linux $HOME/.config/Code/User/settings.json The workspace setting file is located under the .vscode folder in your project. Formatting code in Visual Studio. I have Try to format in Windows 8.
step1. click on view on top menu bar then click on Command Pallete. Default this key was not working for me on HTML, CSS, JS document. After searching I found this popular plugin JS-CSS-HTML Formatter with 133,796 installs after installation just reload windows and hit CTRL + SHIFT + F and it worked! In Mac, use ⌘+K and then ⌘+F. Select the text, right click on the selection and select the option "command palette"
A new window open, search for "format" and select the option which has formatting as per the requirement. If you want to custom the style of format-document, you should use Beautify extention. Have to install the appropriate plug-in first (i.e. XML, C#, etc.). Formatting won't become available until you've installed the relevant plugin, and saved the file with an appropriate extension. Select text ,which you want to format with mouse . Right click and choose "format selection"
This will enable beautify on save for TypeScript, you can add in XML to the HTML option. Enables auto formatting of the code when you save a file. Launch VS Code Quick Open (Ctrl + P), paste the following command, and press enter. Not the answer you're looking for? Browse other questions tagged code-formatting visual-studio-code or ask your own question. How to automatically format XAML code in Visual Studio? How do I format XML in Notepad++? Vertical rulers in Visual Studio Code? How to customize the tab-to-space conversion factor when using Visual Studio Code? How do I collapse sections of code in Visual Studio Code for Windows? How do I duplicate a line or selection within Visual Studio Code? 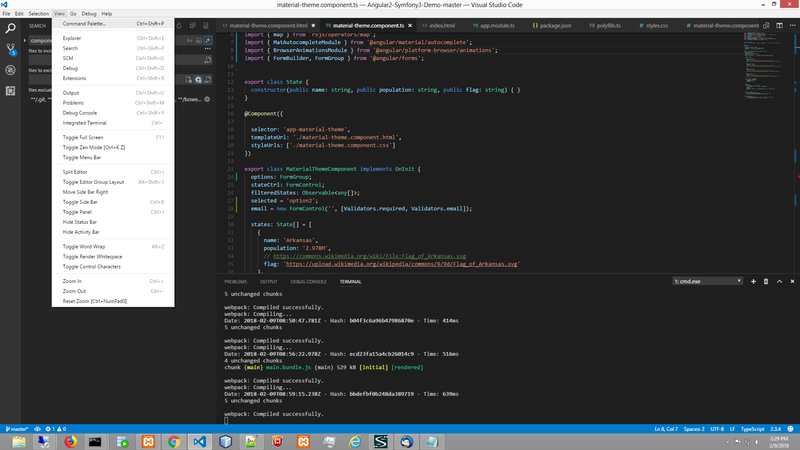 What are the differences between Visual Studio Code and Visual Studio? How to navigate back to the last cursor position in Visual Studio Code? How do I configure Visual Studio Code to open files always in a new tab?